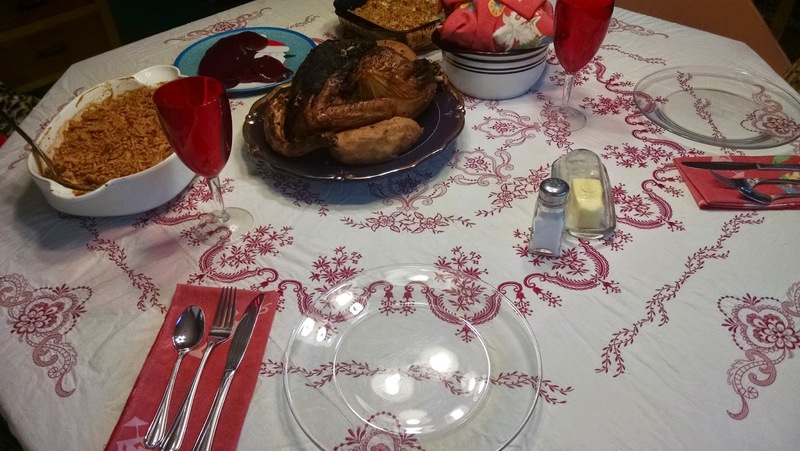 Christmas has come and gone and we are headed toward New Years. Technically, we are closed this coming week. The problem is that instead of a week of rest and relaxation, it is now filled with all sorts of things to do. Some things are pretty mundane, like catching up on our end of the year bookkeeping, getting our annual beach pass and giving the studio a good ceiling to floor cleaning. While others are a bit more fun, like redecorating for Mardi Gras. Ah, and then there are some left over orders that didn't need to be finished for Christmas but need to be completed nevertheless. And, the Etsy Store needs a new 2015 make over taking out the old and putting in the new. 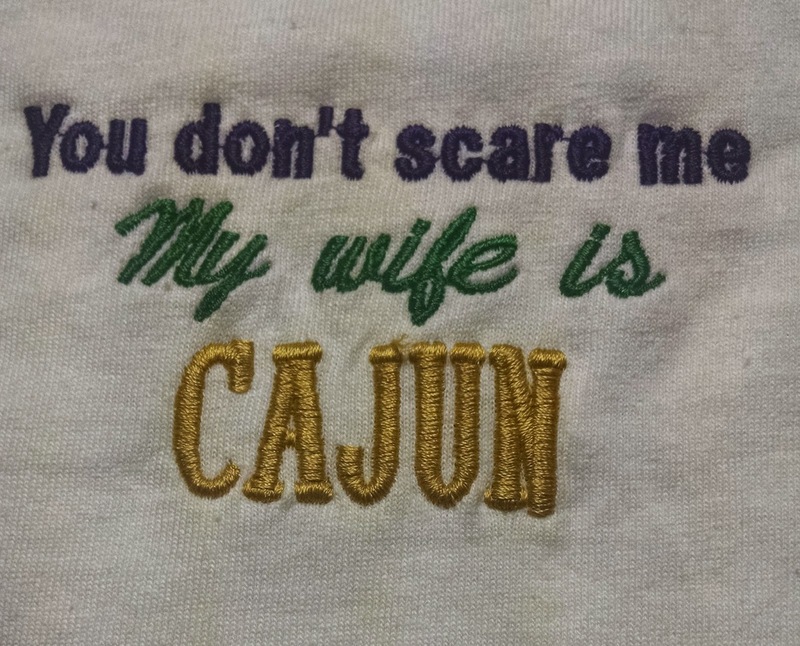 Turning to my trusted Pinterest site, I was looking for ideas on decorating for Mardi Gras. The Christmas tree is already up, so I'm thinking of replacing the Christmas ornaments with Mardi Gras ornaments. Our cute Christmas door decor needs to be replaced with something purple, green and gold. You get the picture. Ideas are flooding my brain. Not to mention that I actually do not have any Mardi Gras ornaments and before I can make some, I need to create them. Basically, it is all just a color change. Changing the red to purple. The green and gold can stay from Christmas. 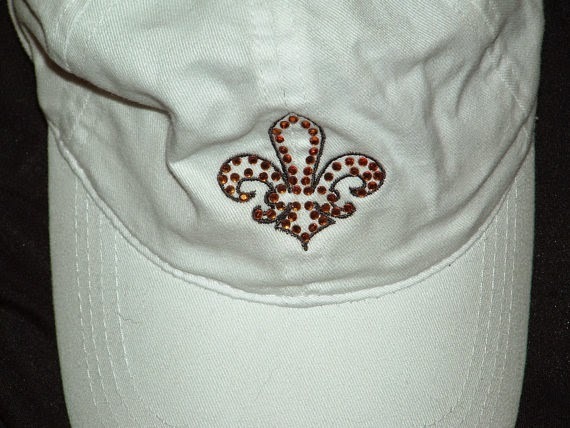 Nativity and Santa/elf designs change to fleur de lis and jester designs. Throw in some shiny Mardi Gras beads and we should be done. Easier said that done. A few months back I took a real good look at our Etsy store and realized there are items in there that have never sold and have sat on the shelves for several years. Most of the stuff is, well, adorable. I guess the person who really wants these items never got a chance to see them. The items in question have been in a "sale" category on Etsy for about a month. Whatever has not been purchased in the Sale category by January 1, 2015, comes off of Etsy permanently. This brings me to the realization that I need more merchandise in the Etsy store to replace the removed items. You know how they say, "you've come a long way, baby"? Looking at those earlier items, yes, we have come a long way. There were some good ideas and some bad. Some items just look cheap and others look nice. 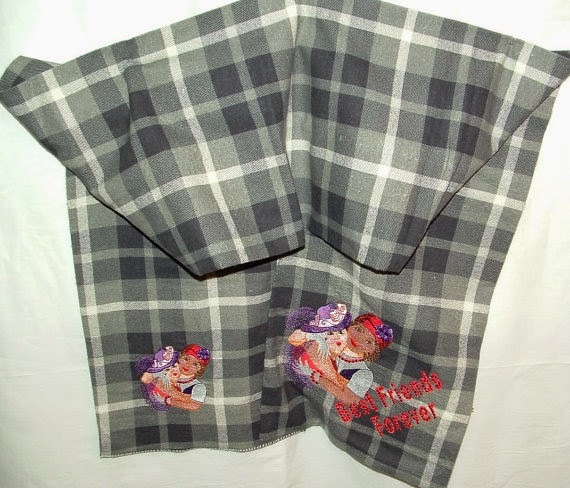 The handkerchiefs stay but the older hankies are going. Bridal hankies will stay but most non-bridal will go. 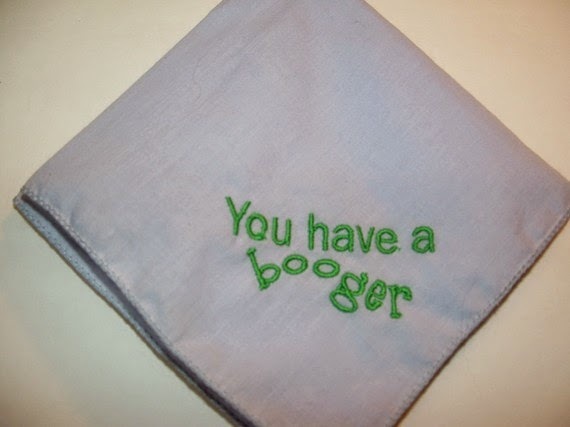 Of course, the "You have a booger" handkerchief will stay because we continue to get orders for it. 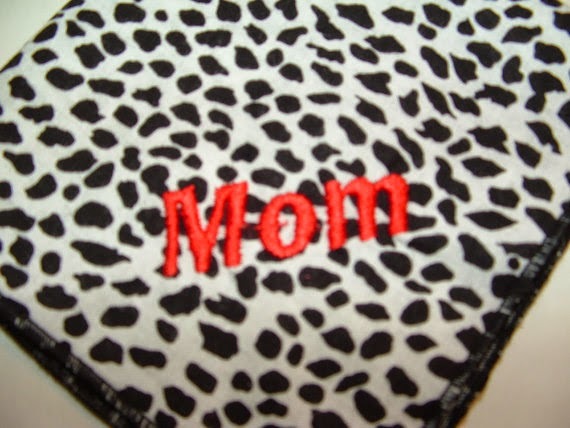 The "Mom" handkerchiefs now in the shop will go but I think we will replace them with nicer "Mom" handkerchiefs. Scarves are staying. I have a dilemma about the scarves. Some sold but not many. I'm not sure if it was the price or style. The scarves in the "Sale" category are going away. The scarves in the "Accessories" category are going to stay and more may be added. 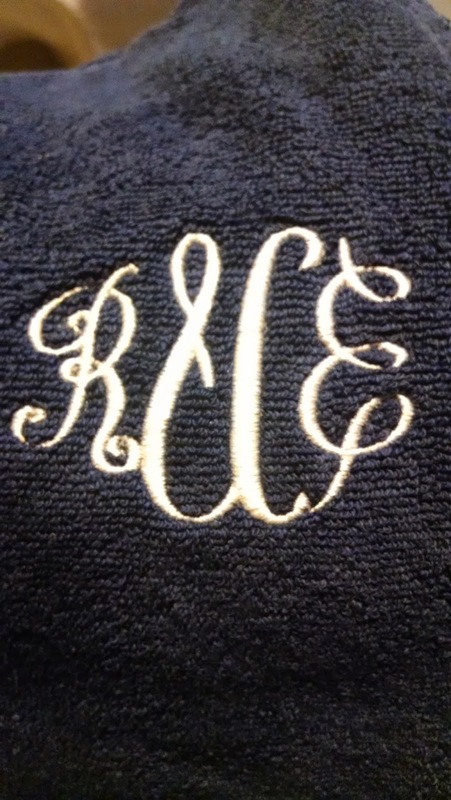 It seems people are more interested in monograms than other designs. 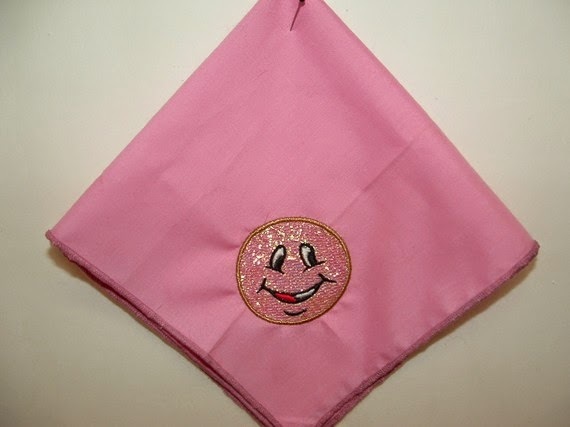 So, we will keep the pretty chiffon scarves for the monograms. The lap scarves will stay, only because I do occasionally get inquiries about them. 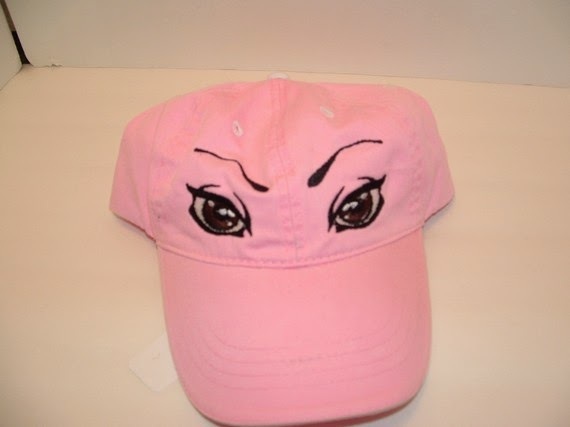 I'm not sure why the ball caps weren't big sellers. They are all adorable and reasonably priced. Nevertheless, they are going away. Perhaps in the future the ball caps may re-appear for weddings with "Mr." and "Mrs." on them but right now I'm over the ball caps. There just doesn't seem to be any interest. Enough about Etsy. 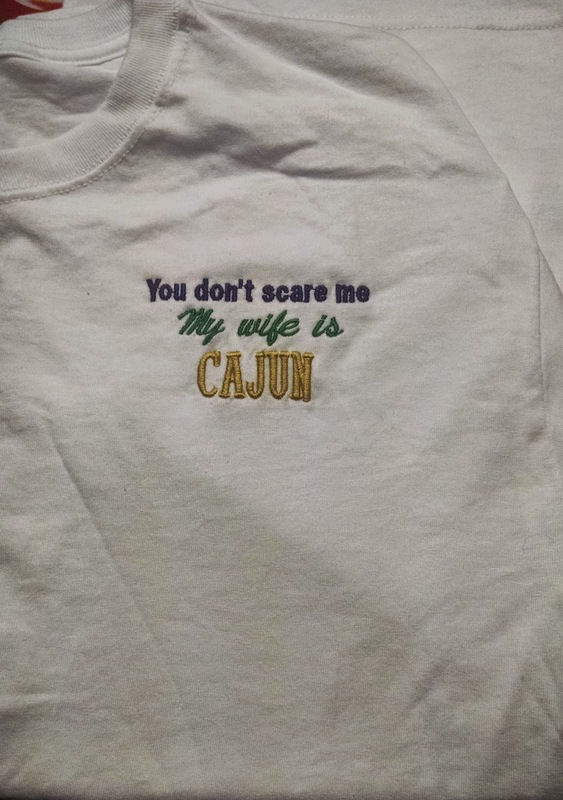 I've had a set of fonts for quite some time but never stitched them out. 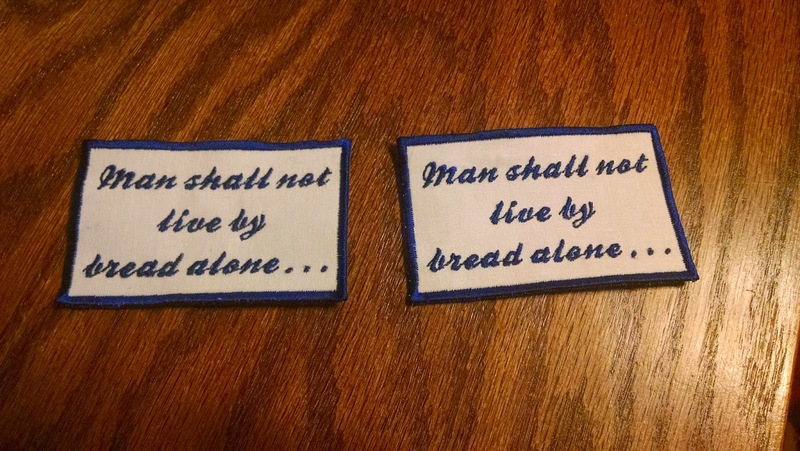 I guess the reason is because I put them together for a sampler and the stitch count was so high, I just never had the time or inclination to stitch them out until this past week. 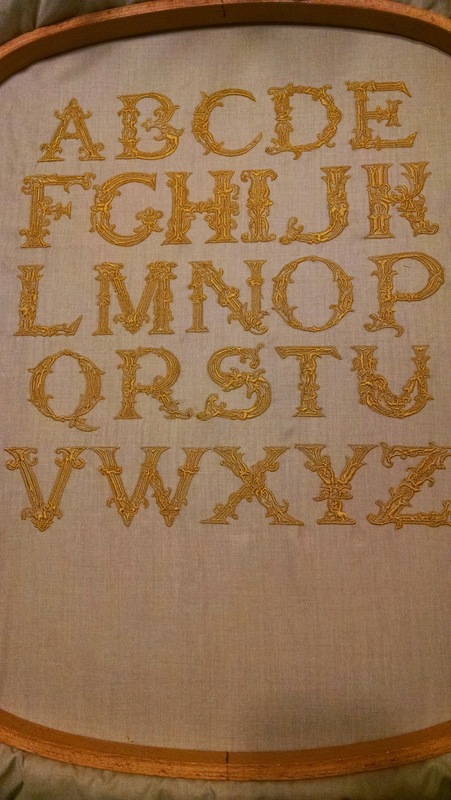 The details in these letters are exquisite. 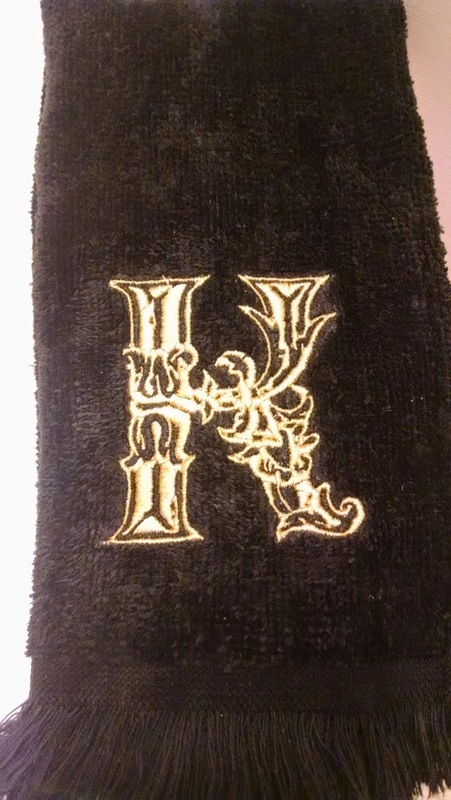 Each letter is about two inches tall and perfect for hand towels and that sort of thing. Every once in awhile we get a customer who wants a custom patch. 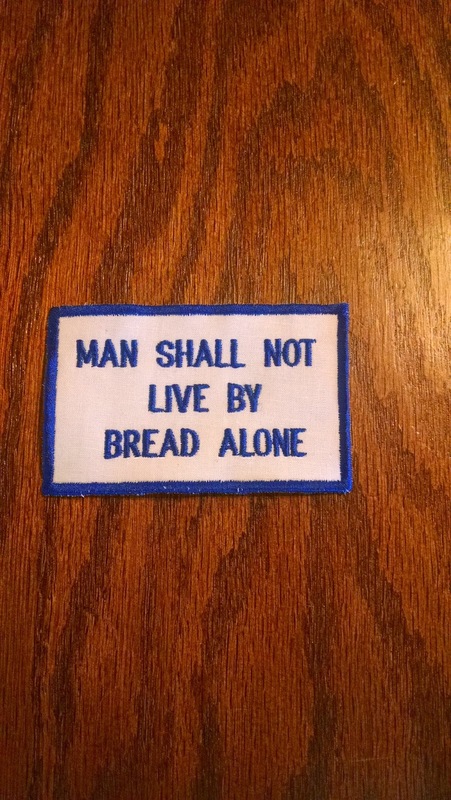 Such is the case with this patch, "Man shall not live by bread alone". It turns out that our customer is a chef turned minister. I think he has a cooking ministry. He is performing a wedding today and wanted to wear his chef attire but the clothing had the logo from his past employer and he wanted patches to cover up the logo. 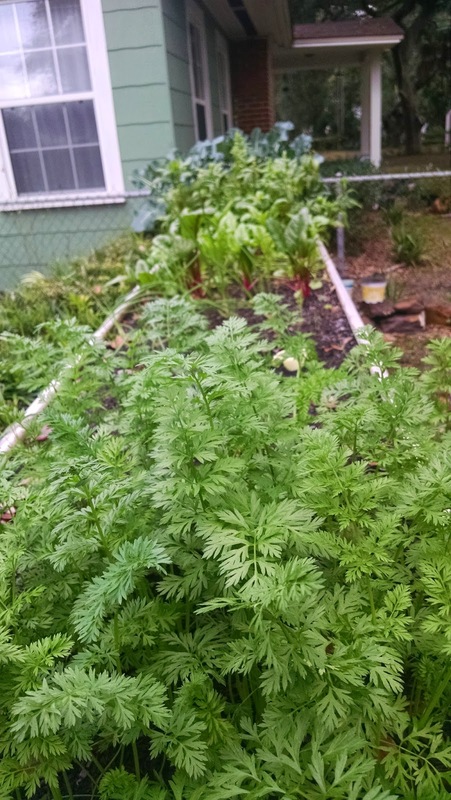 It is the week between Christmas and New Years and look at our garden. 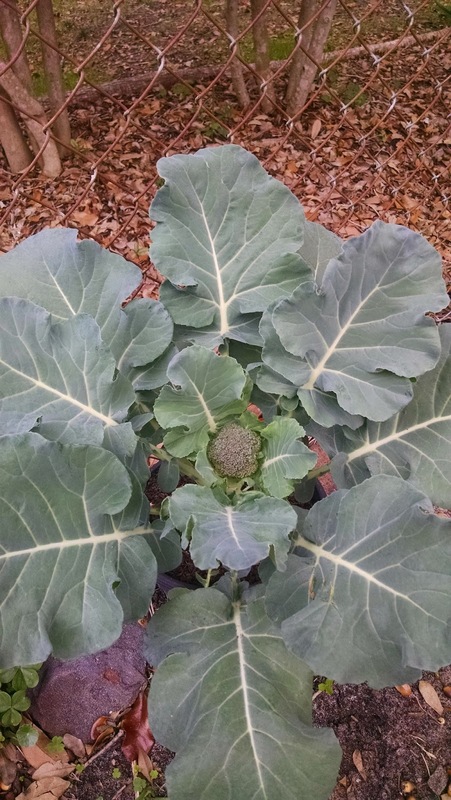 We have swiss chard, lettuce, spinach, broccoli, green onions, and carrots. 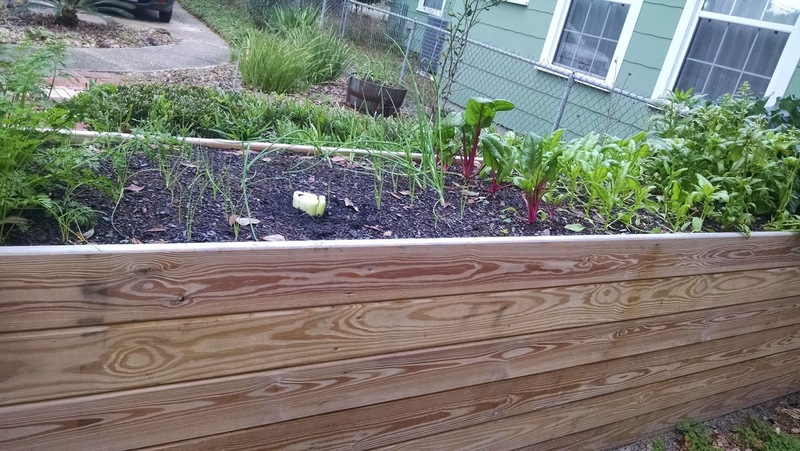 Then we have our special gardening projects. 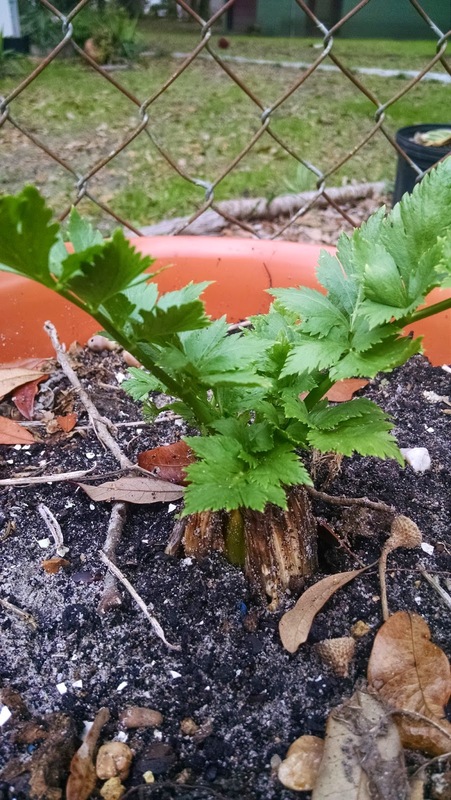 George planted the root end of a bunch of celery we purchased and by golly it is growing. 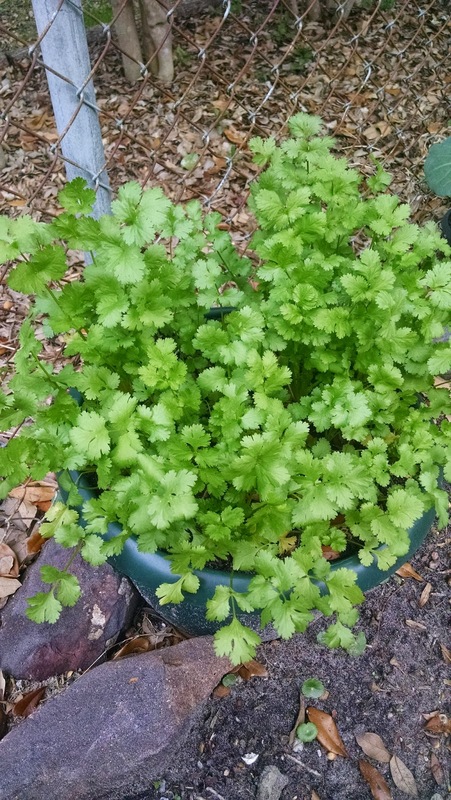 Here's a picture of the cilantro. 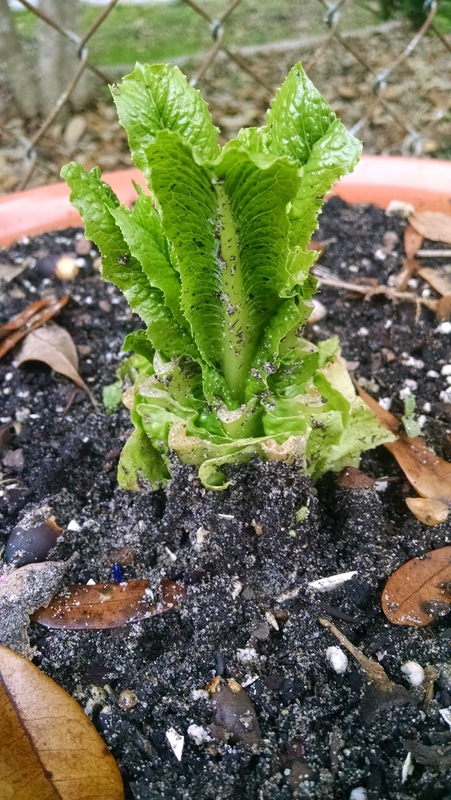 In the same vein as the celery, George planted the root end of some romaine lettuce. Yep, it is growing. Wow! I haven't posted anything in awhile. We've just been so busy. 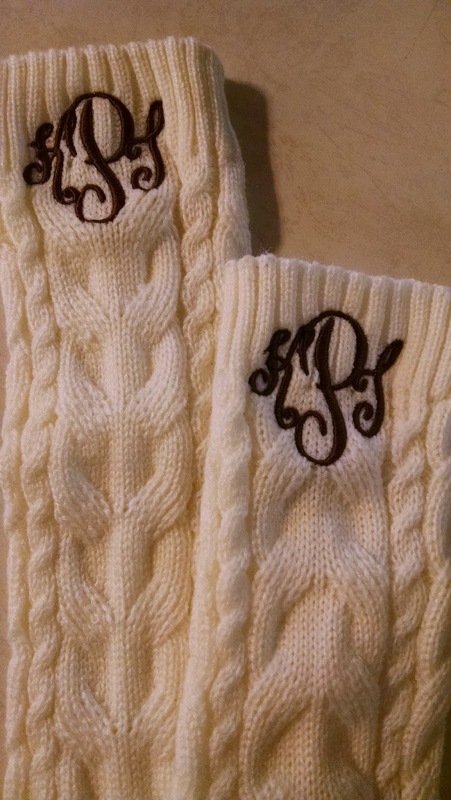 We've made a lot of beautiful things and monograms, oh the monograms. I think I'll just post pictures today. Well, I can't just post pictures, either. Every picture has a story that apparently I must explain. The above pictures are items in our Etsy Store that are on sale. Oh yes, there is a sale in our Etsy Store of items that I've seen around the studio way too long and I'm tired of looking at them. 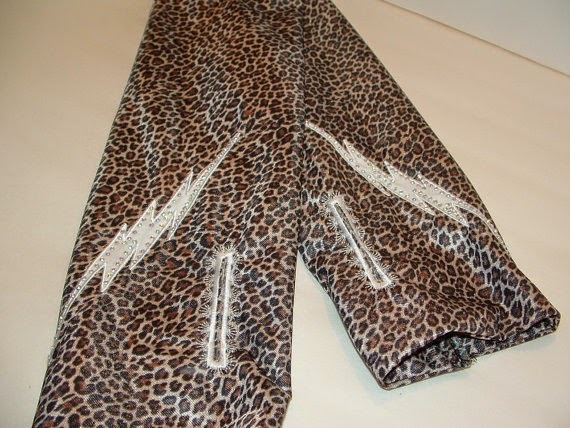 Whatever I don't sell from the sales items are going to be gifts for my girlfriends next year. I think we have something like 78 items remaining. Once they are gone, they are gone, because they will then be gifts. I love this little beach Santa. 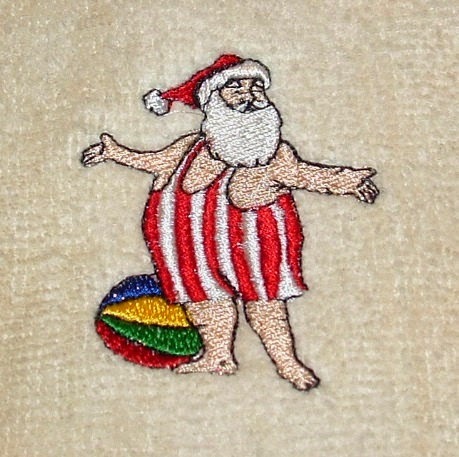 There is a set of beach Santas but I'm pretty partial to this one and again this year put him on a tea towel and he's for sale in, where else, our Etsy Store. Of course, the Christmas items will come out of the store once Christmas is over. 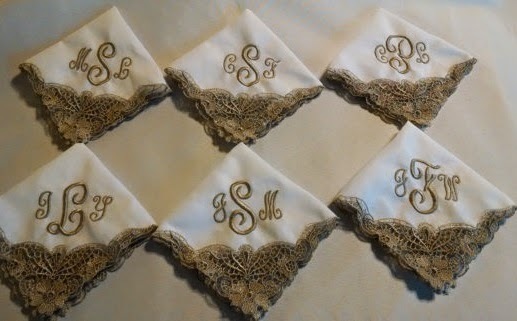 These lace handkerchiefs have been our best seller this year, by far. People have purchased other handkerchiefs but these have out sold everything in the store. They really are pretty and I thought they deserved a picture in the blog. 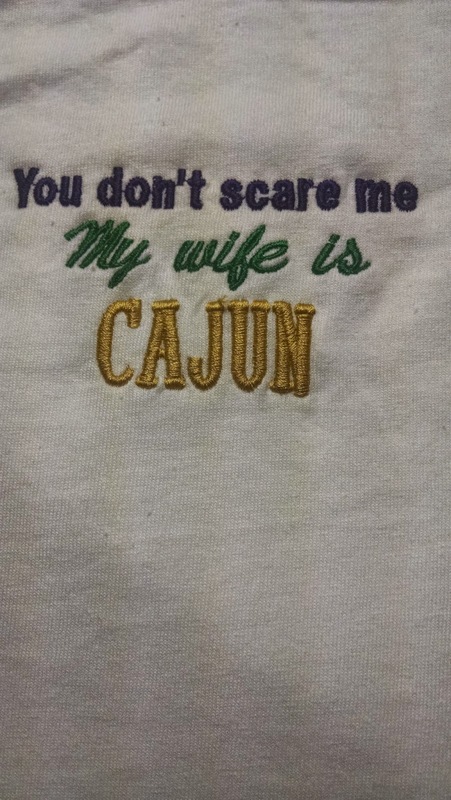 The baby bibs are new items this year. 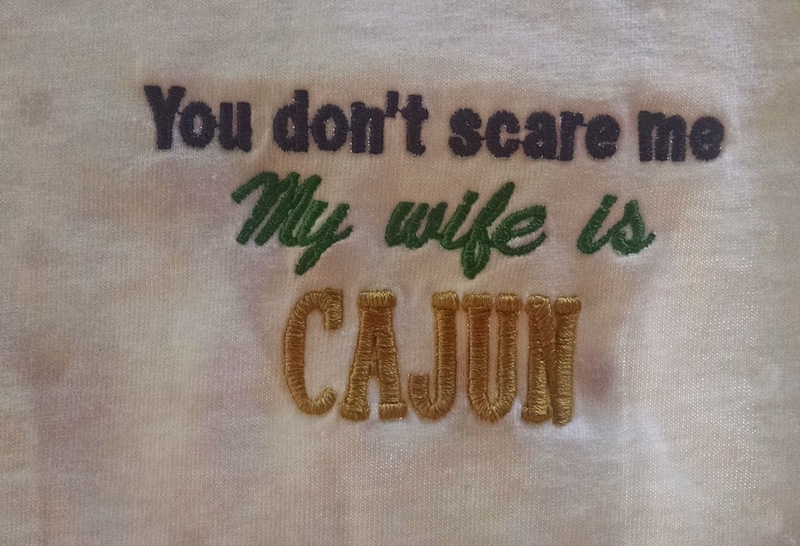 I think in past years I may have listed one or two of the rectangular bibs but this year we increased our baby bibs with several new styles, as well as baby tee shirts. This scarf is not only beautiful but soft as a cloud. 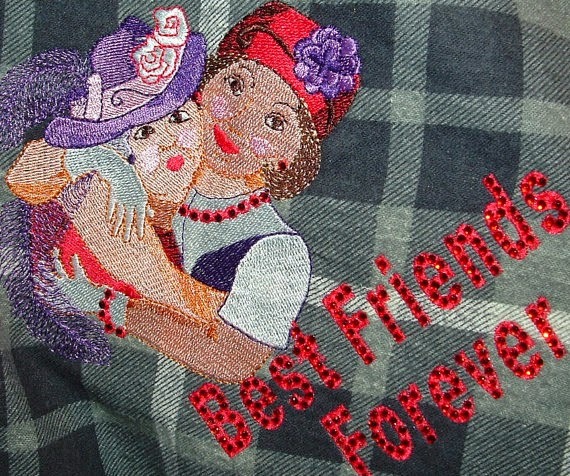 I may have written about these scarves earlier, so forgive me if I am repeating myself. 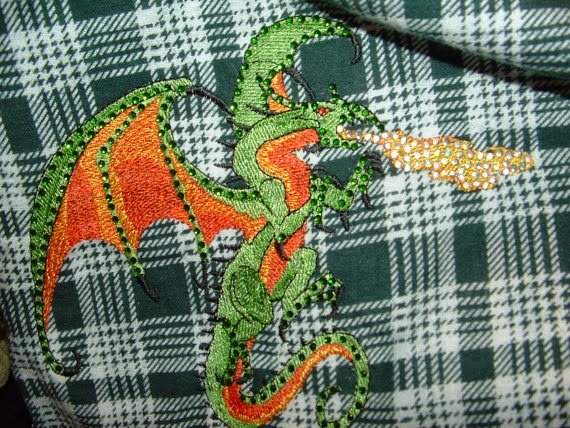 The scarves are listed as poly chiffon. They feel just like chiffon and did I mention how soft they are. 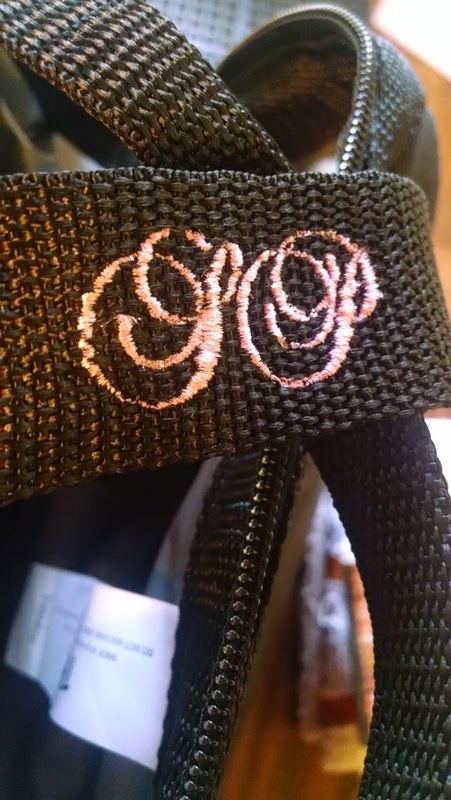 I was so pleased to find that I can hoop them and monogram they. So, they are in our Etsy store now, too. In fact, I need to change that listing a little because now we have these scarves in ivory, gold, peach, and I think white. I'll have to double check the white. 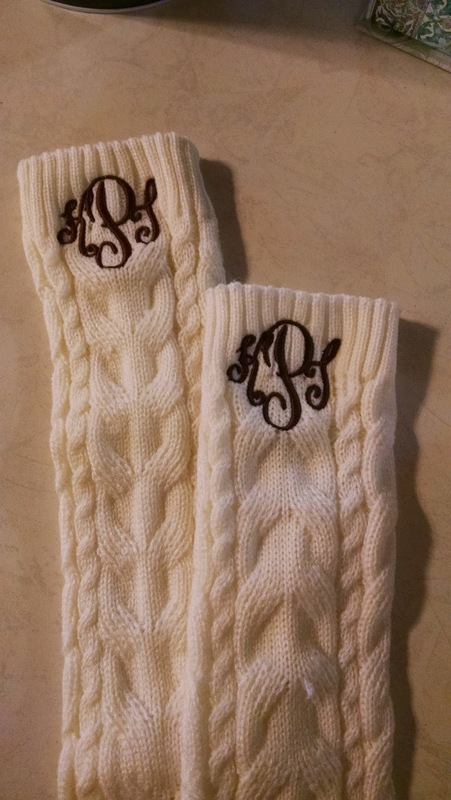 A young lady asked me to monogram these leg warmers. I wonder where she found them. They are so pretty. Well, I was looking through all of my fonts and found this really nice monogram font. She liked them and I liked them. 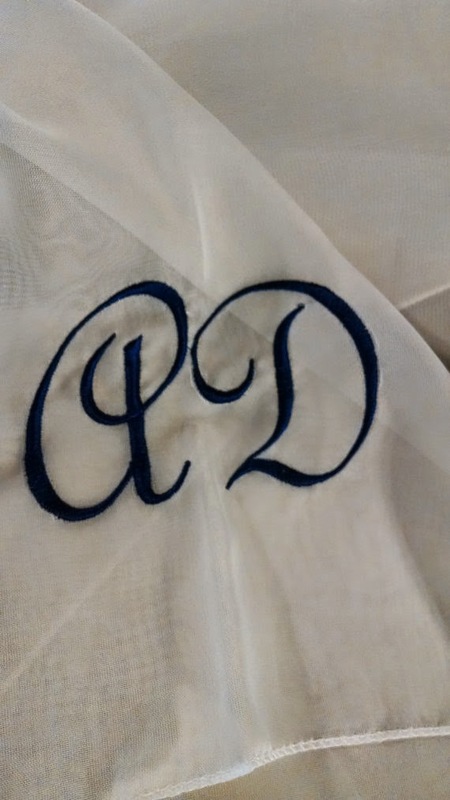 As much as I do not like to use washaway topping, I did use it on these monograms. 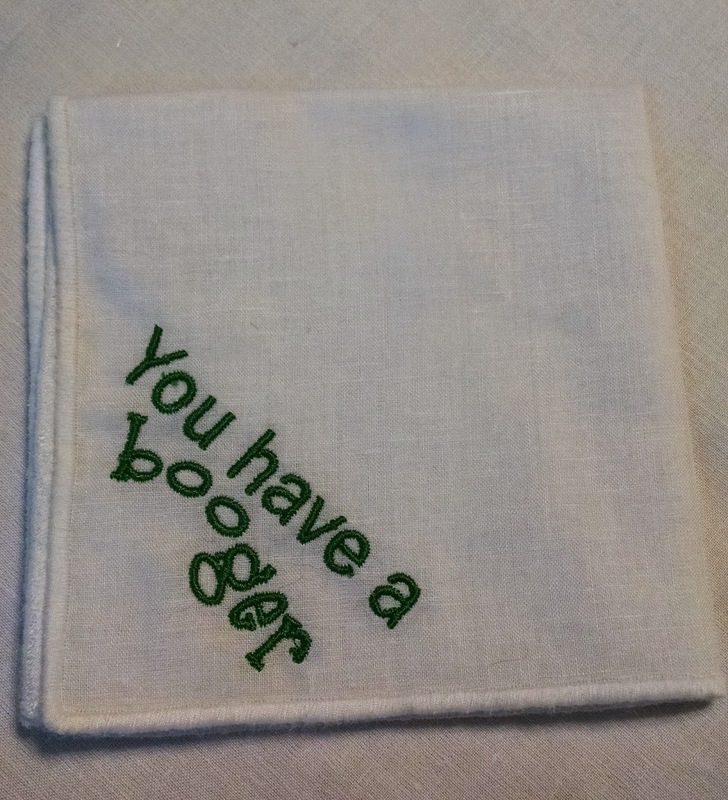 If you have been watching this blog, and of course you have, you will know how tickled I get about people purchasing our "You have a booger" handkerchiefs. 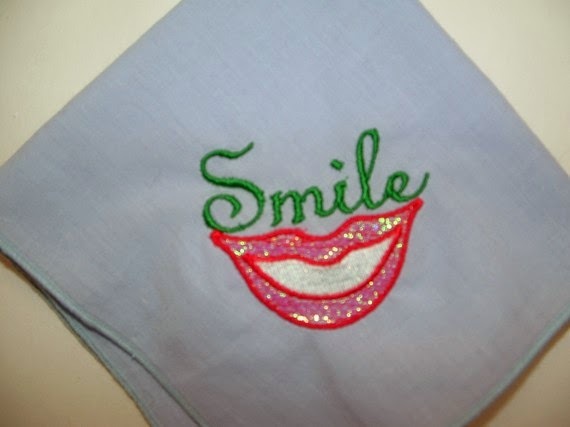 This year I stopped listing these handkerchiefs. I figured that their day was done and I should move onto nicer items. Oh but NO. 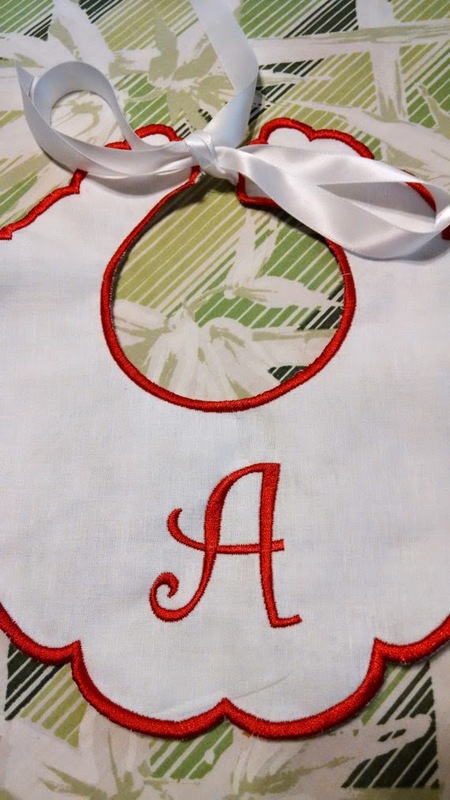 A lady convo'ed me on Etsy with the above picture and asked if I would make one for her husband for Christmas on white fabric with green thread. 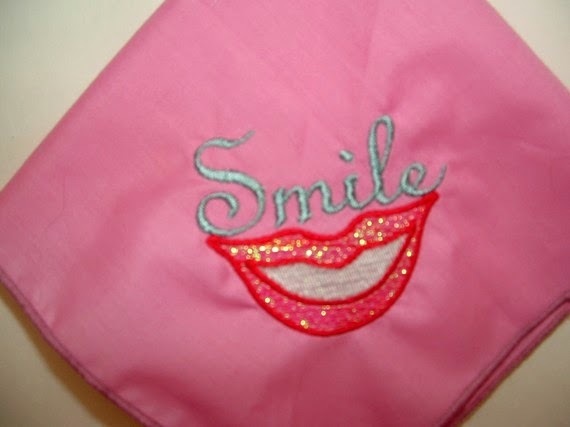 This is the handkerchief that I made for her and she loves it. Perhaps I should include this listing one more time. My daughter-in-law never ceases to amaze me. 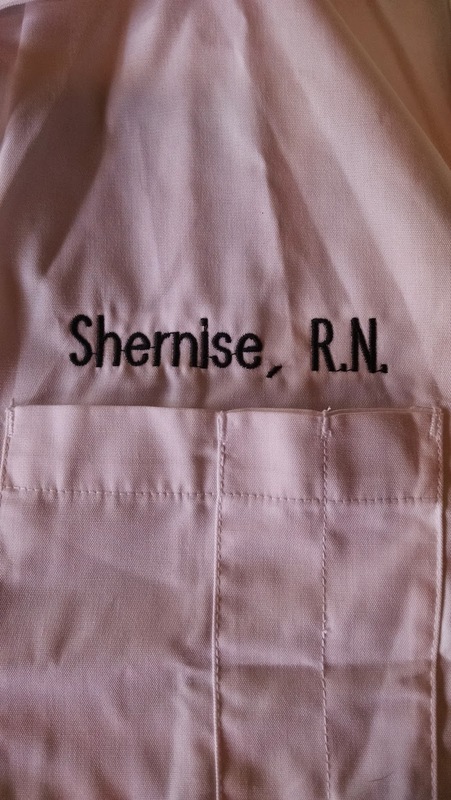 This year she graduated with her bachelor's degree in nursing and is now a RN with a bachelor's degree. 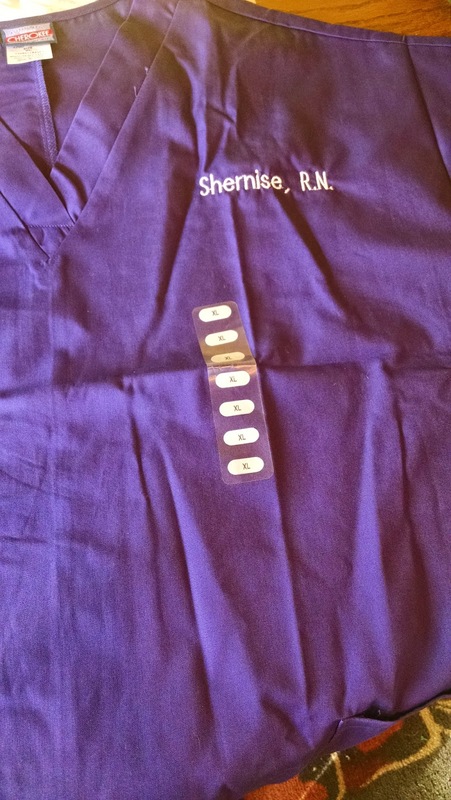 What else should I have given her for Christmas but a white nursing jacket and a set of scrubs in her favorite color, purple. 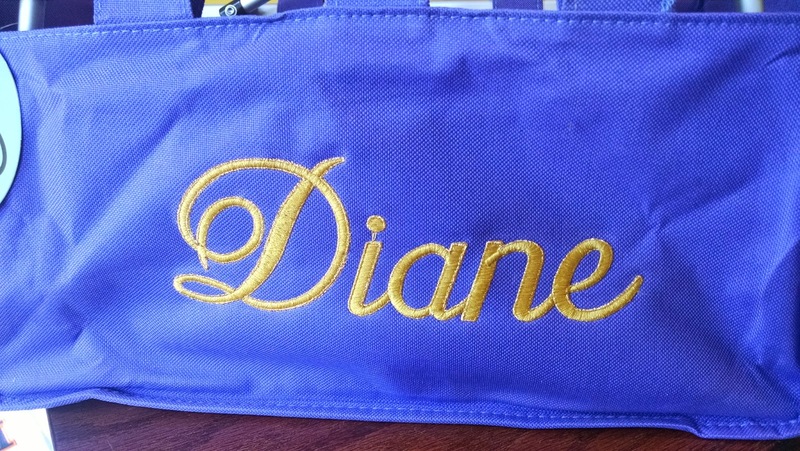 And her name embroidered on the items. All of my grandchildren get money for Christmas but my 2 year old great granddaughter is too young to care about money. 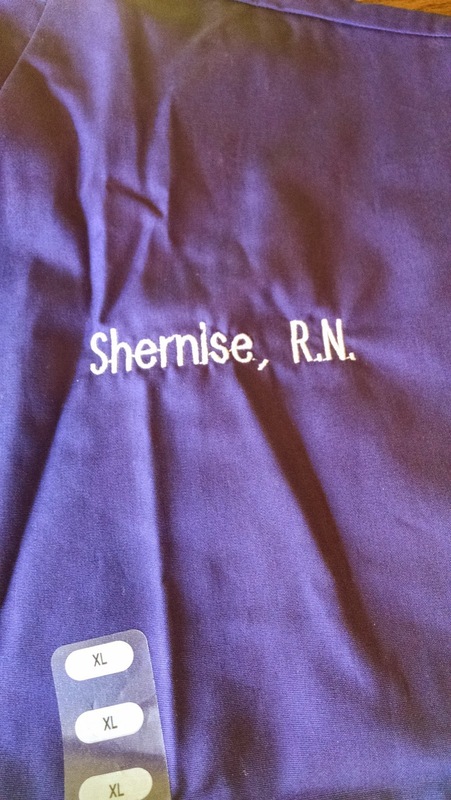 We did get her a cute educational toy but, hey, she's my great granddaughter and needs embroidery. 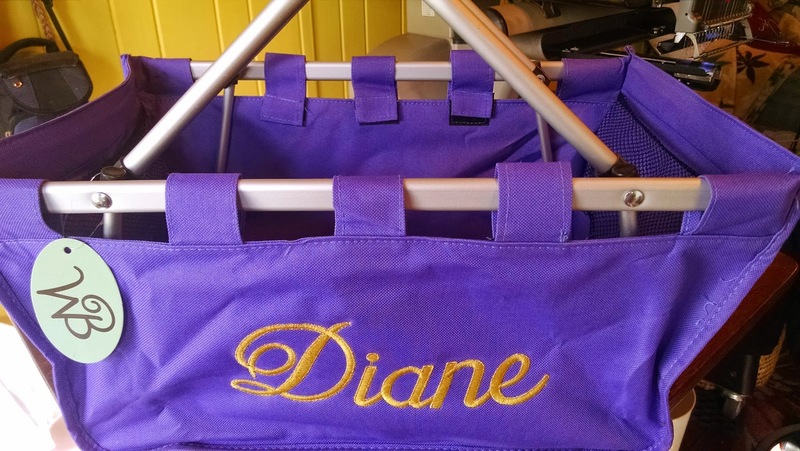 I had these tiny little totes that are a perfect size for a 2 year old. 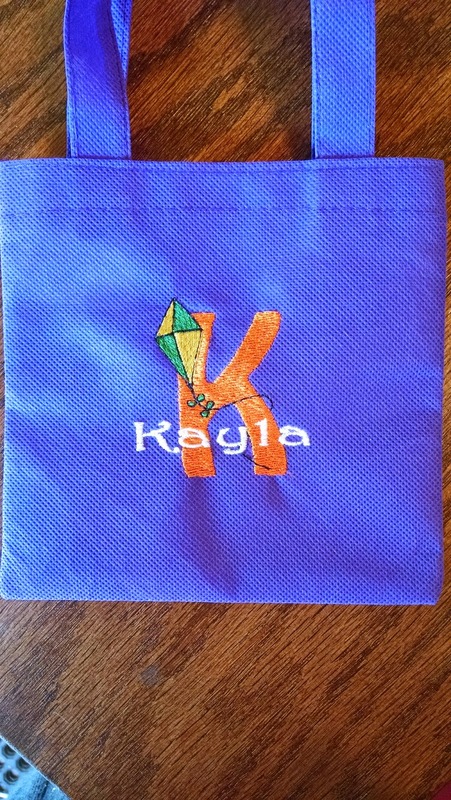 I think the monogram is cute and she is like a big girl and has her own purse. What I don't understand is why I have such a hard time photographing purple? It either turns out blue or in this case, every photograph is a different shade of purple. Here is another example of the problem photographing the color purple. But didn't this market basket turn out nice? 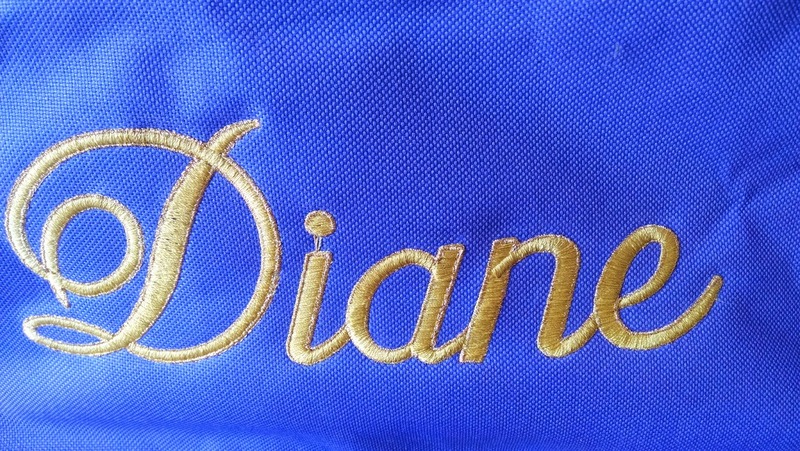 I used gold poly thread but outlined the name in gold metallic thread. It turned out beautiful and the customer is very pleased. 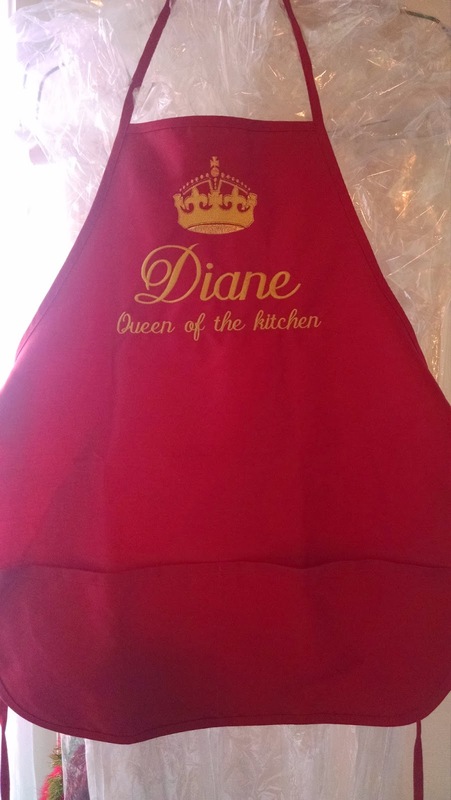 Same customer wanted this apron. 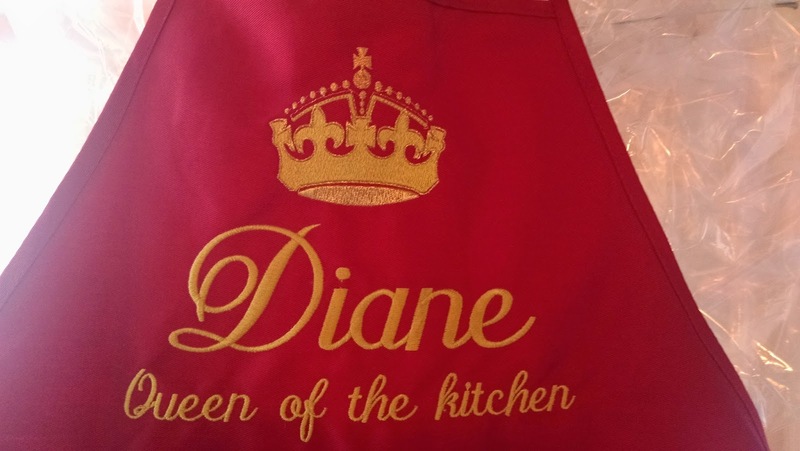 I used the same gold poly thread on the lettering and the center of the crown. 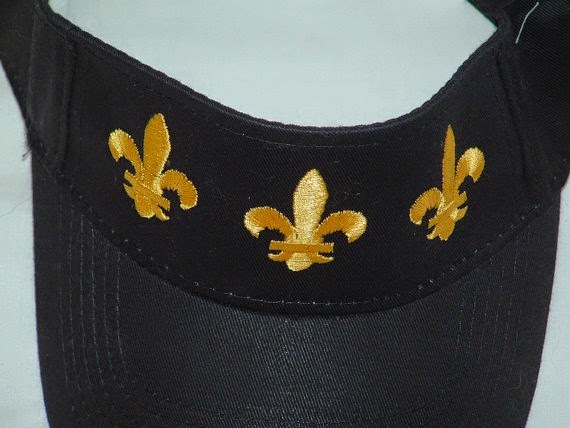 The bottom of the crown and the dots, etc., at the top are in gold metallic. 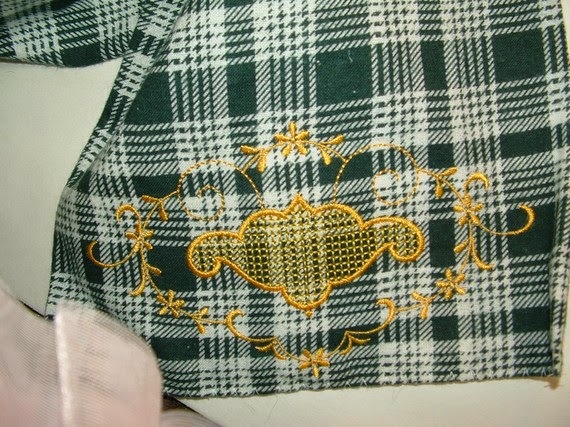 It is also outlined in gold metallic. Sure turned out pretty. 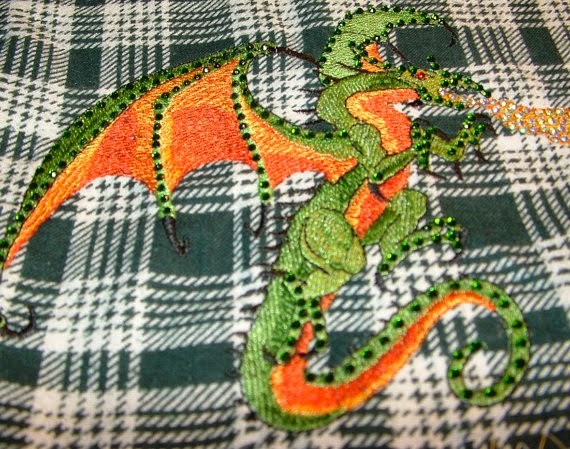 I saw this on the internet and thought it would make a great embroidery design. 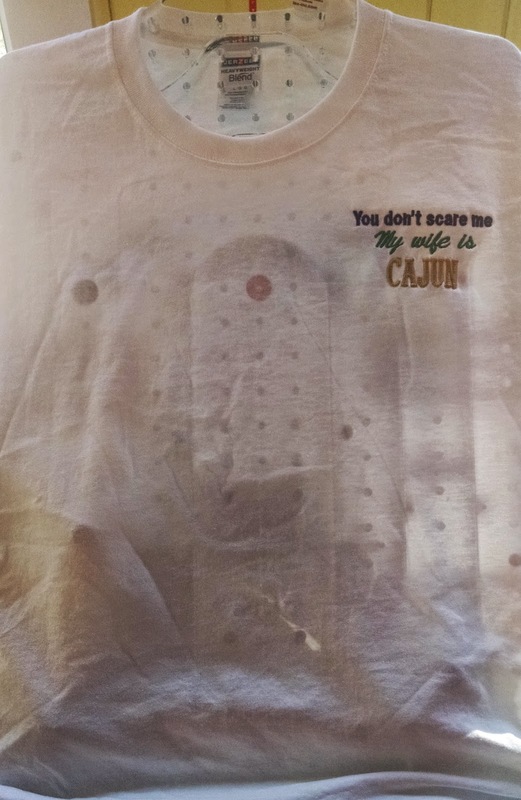 I wanted to list it in our Etsy Store on something and decided to put it on a white tee shirt. 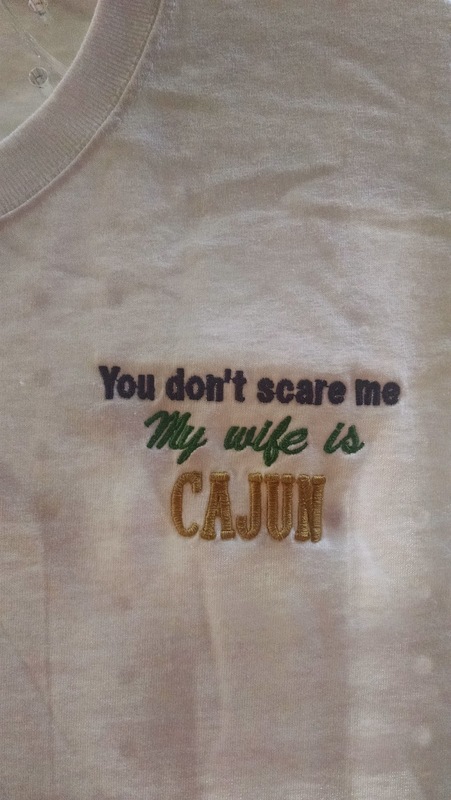 Yes, it is listed in our Etsy Store. Photography just isn't my best suit. 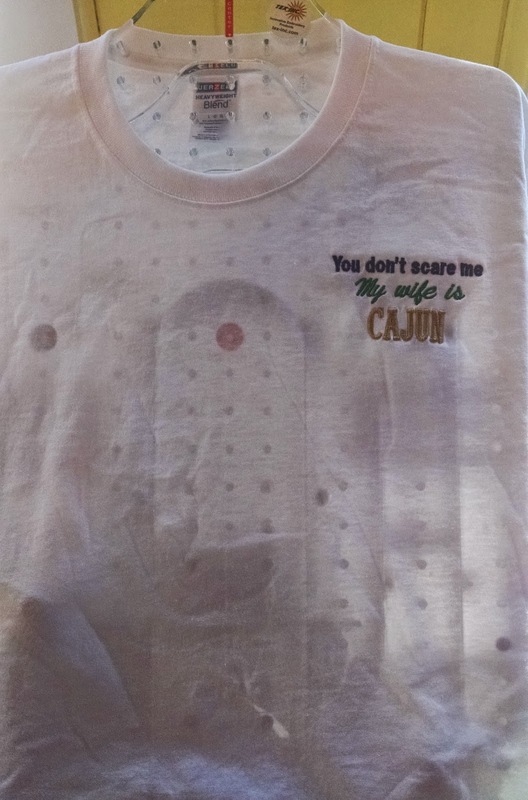 I put the completed tee shirt on my hoop-it-all and those holes and buttons and labels and thingamajigs all showed through the white tee. I ended up folding the tee shirt and taking the pictures that way. Then I gave the tee shirt to George as an early Christmas present. Such a good wife. LOL. 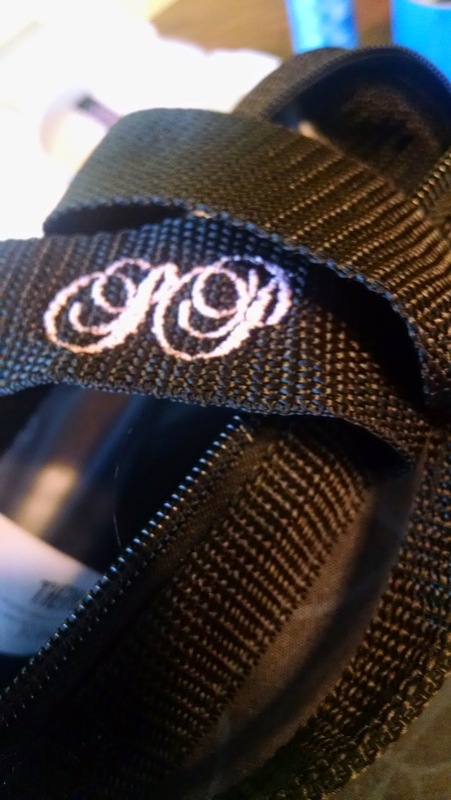 A young gentleman brought over a Thermos lunch bag and wanted me to embroider his sister's initials on the straps for Christmas. 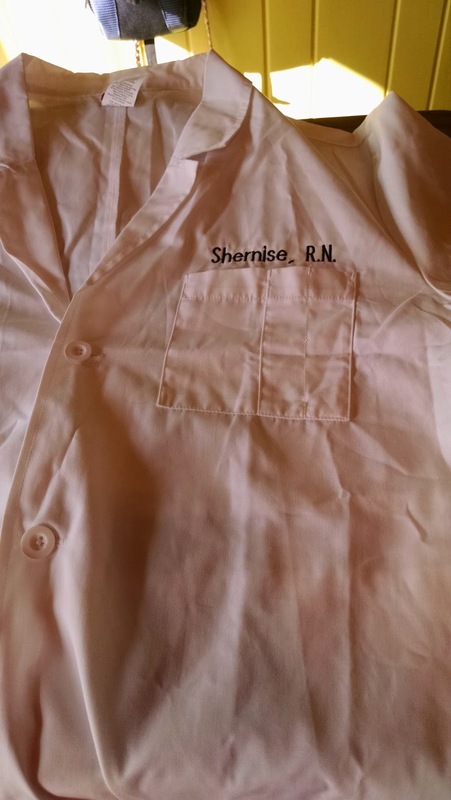 My instructions were a script monogram with pink thread and very girly font. So, I did exactly as instructed. Today he came by and said he cannot read the letters and wants me to embroider printed letters on the other side of the straps. I'll do as the customer wants. A young fellow in an Air Force uniform brought over a lovely robe he bought for his wife for Christmas. He wants her monogram in white. It turned out so nice. 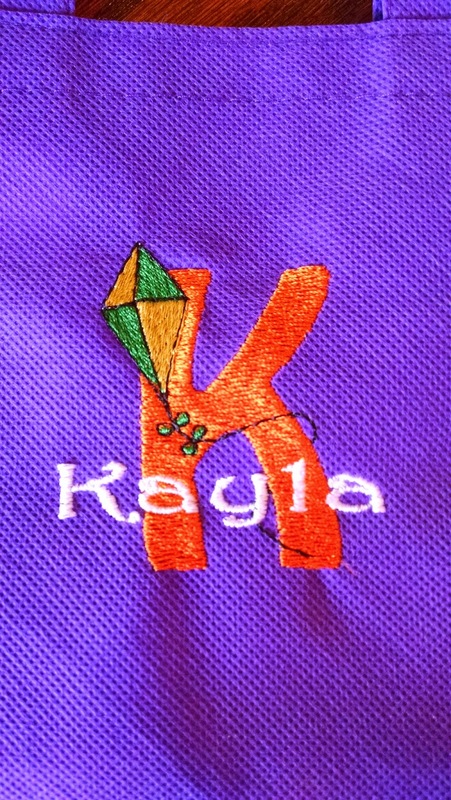 Just browsing through many monograms, lettering, and fonts that I have on my computer, I saw that I actually put this font together for a sampler but never stitched it out. The reason, I'm sure, is because the whole thing is about 150,000 stitches. Nevertheless, I did this today. 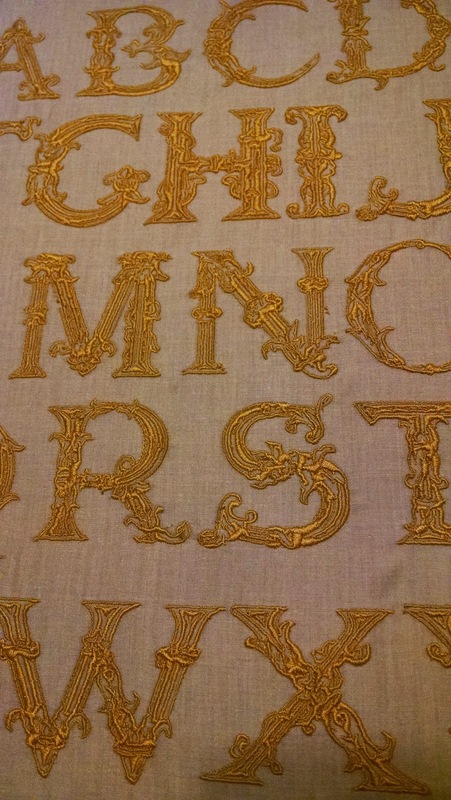 The letters are 2" tall and I'm completely blown away by the beautiful detail in these letters.